Trading in Stocks, commodities and currency has become quite popular to make good financial gains in relatively short span of time. However, out of thousands of speculators involved in the markets a very small percentage of them are successful. Some people seem to have the natural talent for speculation and mint money everyday easily. Several others seem to struggle and loose money consistently and in the long run loose their shirt and pant. Speculation is a mind game and cosmic powers do influence our thoughts and actions. Vedic Astrology readings of horoscope can be utilized to know if a person is fortunately destined to enjoy financial gains in speculative trading in share or commodity market. The element of Speculative Luck potential is ingrained in our Natal Chart. By analysis of your Natal Chart, this report will make you aware that whether you are the appropriate person to enter speculation, or not. Kindly note that the main purpose of this report is to safeguard you from losses rather than your making financial gains from speculative activities. Any actions or decisions that involve risk, hopes and forecasts of future events are described as speculative. From a stock market or commodity market speculator's point of view, four houses are mainly important - the 5th, 9th, 2nd & 11th. Fifth house is slightly weak in Sarvaashtak; quite afflicted due to malefics aspect(s) and Ashtakvarga beneficence of 5th lord towards its own house is poor. However, 5th Lord itself is in very good condition. Exaltation, dignity and Ashtakvarga status etc are OK. There is no afflictive aspects. Condition of 9th house is moderately OK. There is no malefic aspects on 9th house. The 9th lord is slightly afflicted but Ashtakvarga status is good. The condition of Mercury should be rated as "Poor" in your chart. It is highly aflicted. Ashtakvarga status is also quite poor. It is posited in a non-contributor's kakshya. Besides the 5th & 9th houses, the 3rd is a supportive house being the 11th from 5th house. The 6th House identifies the chances of winning in speculative activities. The 2nd and 11th houses signify riches. If these houses are unafflicted and their lords are well-placed and well-aspected, they assure good returns in share markets through speculation. 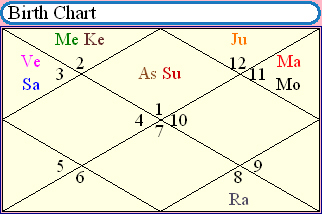 Besides Mercury, the Rahu and Mars are also involved in case of aggressive day traders (shares/ commodities/ forex). Overall, your chart does not permit speculation most of the times. You should indulge in speculation during your "Very good" times only and in very selected sectors. Reckless speculation may put you in grave financial problems. At the end, I wish to remind you that this report is all about "Natal promises for Speculative Gains" in the birth chart. It does not analyze your different good or bad periods. As I already said that the element of Speculative Luck potential is ingrained in our Natal Chart. By analysis of your Natal Chart, this report simply makes you aware that whether you are the appropriate person to enter speculation, or not.